From AP reports … Hundreds of thousands of homes are without power in ice-ravaged Appalachia. Dozens of deaths have been reported, and many have run short of food and bottled water. First responders have their hands full. Anger is building at the perceived lack of assistance from FEMA. In Kentucky’s Grayson County, about 80 miles southwest of Louisville, Emergency Management Director Randell Smith said the 25 National Guardsmen who have responded have no chain saws to clear fallen trees. He said roads are littered with fallen trees and people shivering in bone-chilling cold are in need. Our prayers go out to all those folks in the affected areas. Those of us who have had dealings with FEMA’s disaster support have much sympathy for those of you who will need their assistance. They are the most screwed up Federal agency ever conceived. And, as much as I would enjoy taking this opportunity to make the claim that FEMA’s failure is proof that Barack Obama hates white people, I won’t. WFFOT: Still want that flying car? New Scientist takes a look at “Ten sci-fi devices that could soon be in your hands”. Yes friends, the flying car is included. Or personal spaceship, or your own jet-pack. Old news you say? Maybe. But, this part seems kind of interesting to me..
your personal spacecraft could fly into orbit on a beam of microwaves shone upwards from the ground. Bad news? The inventor says it’s still 50 years away. I don’t think I’ll be able to wait for that one. But some of the other devices don’t have such a long lead time. This is the World Famous Friday Open Thread. A free speech zone. Track-backs welcome. Trackposted to The Virtuous Republic, Rosemary’s Thoughts, Wingless – Alastair Crooke on Gaza & Hamas – living in the twilight zone!, DragonLady’s World, Wingless – Sura 5:32 – When Killing isn’t Murder, Cao’s Blog, Leaning Straight Up, Democrat=Socialist, Conservative Cat, Allie is Wired, Political Byline, third world county, Woman Honor Thyself, Wingless – What Lead to Cast Lead, The World According to Carl, Wingless – Cuba: Beautiful Country, People…Not so Beautiful System…, Rosemary’s News and Ideas, The Pink Flamingo, Wingless, and Right Voices, thanks to Linkfest Haven Deluxe. Jacksonville News is reporting that the long-time keyboard player for Lynyrd Skynyrd has died. Billy Powell was 56. Billy Powell, a longtime keyboard player for Lynyrd Skynyrd who survived the band’s 1977 plane crash, died at his Orange Park condo early this morning, according to police. Orange Park Police Chief James Boivin said Powell called 911 from his condo in Club Continental and was pronounced dead at 1:52 a.m. after rescue crews performed CPR on him. Boivin said he was told Powell had an appointment with his heart specialist Monday but never made the appointment. 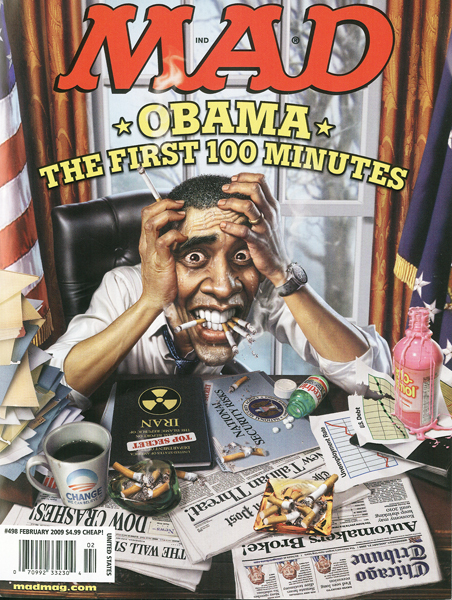 Mad Magazine looks at Obama. President Obama has decided to back off from a trade war for now. Turns out he isn’t quite ready to begin a Trans-Pacific trade war with the Chinese after all. U. .S. Treasury Secretary-designate Timothy Geithner was not making a formal finding last week when he told senators China was manipulating its currency, a White House official said on Monday. See? 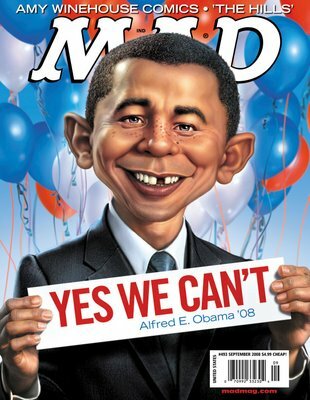 It was just something Obama said, not what he really meant. Or something like that. Kind of like the “No Lobbyists” rule. Yesterday it was William Lynn, and today it was William Corr. Critical times indeed. So critical, that the the Pelosi House has included a wad of money to fund contraception and family planning in the critical economic stimulus package. Because, as we know, elections have consequences, as Obama reminded us yesterday in his “I Won” comment (later explained away by Robert Gibbs as not to be a “cowboy moment”). Thanks for clearing that up for us Robert. Update: It looks like Pelosi’s contraceptive stimulus won’t make the final cut after all. Obama appears to be backing off, but Robert Gibbs has been so busy, he sent out the B-team. The “campaign architect,” as he is commonly called, built a case against President Barack Obama’s order to close Guantanamo, an overseas CIA detention center where terrorists and other “enemy combatants” are held. Obama’s order could enable terrorists to be tried in U.S. courts, to be given undeserved rights afforded American citizens and could cause damaging long-term effects, Rove said.